Once the bowel segment has become occluded, gross dilatation of the proximal limb of bowel occurs, resulting in an increased peristalsis of the bowel. This leads to secretion of large volumes of electrolyte-rich fluid into the bowel (often termed ‘third spacing’). Urgent fluid resuscitation and close attention to fluid balance is thus essential. If there is a second obstruction proximally (such as in a volvulus or in large bowel obstruction with a competent ileocaecal valve) this is termed a closed-loop obstruction. This is a surgical emergency as the bowel will continue to distend, stretching the bowel wall until it becomes ischaemic and / or perforates. The full list of causes of bowel obstruction can otherwise be divided into extrinsic, intramural, and intraluminal causes, as described in Table 1. It is important to remember that patients may not display all of these features at once. For example, in patients with very distal obstructions, vomiting will develop late, if at all. Likewise, the more proximal the obstruction, the later the constipation will develop. On examination, patients may show evidence of the underlying cause (e.g. surgical scars, cachexia from malignancy, or obvious hernia) and abdominal distension. Ensure to assess the patient’s fluid status. Palpate for focal tenderness* (including guarding and rebound tenderness on palpation). Percussion may reveal a tympanic sound and auscultation may reveal ‘tinkling’ bowel sounds, both signs characteristic of bowel obstruction. An venous blood gas can be useful to evaluate the signs of ischaemia (high lactate) or for the immediate assessment of any metabolic derangement (secondary to dehydration or excessive vomiting). A CT scan with IV contrast of the abdomen and pelvis is the imaging modality of choice in suspected bowel obstruction and shift in modern practice is moving towards CT scanning as the initial imaging used where possible. 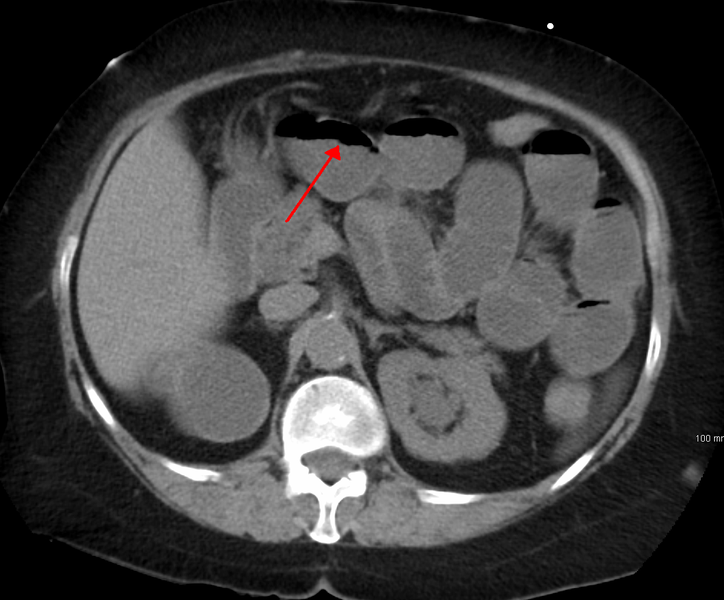 CT imaging (Fig. 2) is more useful than AXRs as they are (1) more sensitive for bowel obstruction; (2) can differentiate between mechanical obstruction and pseudo-obstruction; (3) can demonstrate the site and cause of obstruction (hence useful for operative planning); and (4) may demonstrate the presence of metastases if caused by a malignancy (which is likewise useful in operative planning). An incompetent ileocaecal valve in a large bowel obstruction may show concurrent large and small bowel dilatation on AXR. An erect chest x-ray may also be requested to assess for free air under the diaphragm if clinical features suggest a bowel perforation. The definitive management of bowel obstruction is dependent on the aetiology and whether it has been complicated by bowel ischaemia, perforation, and/or peritonism. These patients are often intavascularly fluid deplete. All patients therefore need urgent fluid resuscitation and careful attention paid to fluid balance (often several litres of intravenous fluid may be required in the first 24 hours). Most require a urinary catheter. Patients with closed loop bowel obstruction or evidence of ischaemia (pain worsened by movement, focal tenderness and pyrexia) require urgent surgery. Adhesional small bowel obstruction resulting from previous surgery is treated conservatively in the first instance (unless there is evidence of strangulation / ischaemia), with a success rate of around 80%. A water soluble contrast study should be performed in cases that do not resolve within 24 hours conservative management. If contrast does not reach the colon by 6 hours then it is very unlikely that it will resolve and the patient should be taken to theatre. 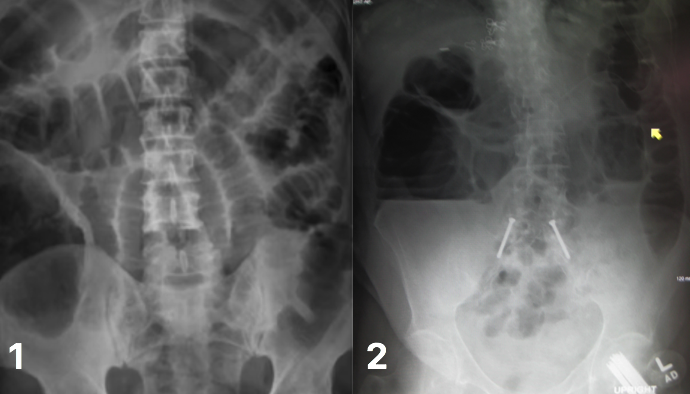 Large bowel obstruction or small bowel obstruction in a patient who has not had previous surgery (termed a “virgin abdomen”) rarely settles without surgery. The nature of surgical management will depend on the underlying cause but generally will warrant a laparotomy. 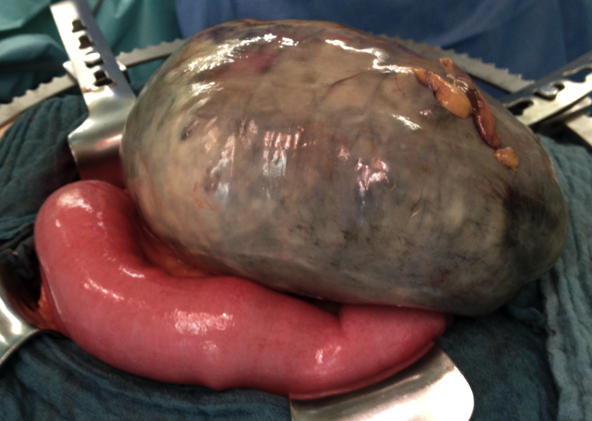 If resection of bowel is required, the re-joining of obstructed bowel is often not possible and a stoma may be necessary. 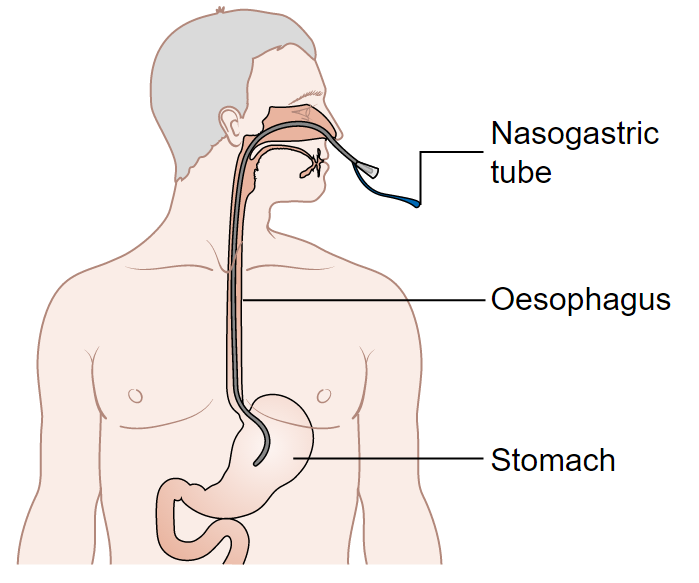 Which of the following is a typical symptom of small bowel obstruction? Which clinical feature is most likely to be absent in a 'closed-loop' obstruction? Which of the following examination signs indicates that ischaemia may be developing? Which measurement in an arterial blood gas is most indicative of ischaemia? What is an indication for surgical intervention in bowel obstruction? Which of the following is not associated with elevated lactate levels in a patient with small bowel obstruction? Which of the following is most likely to result in a complete bowel obstruction?